Grains are the foundation of many menus and recipes that you feed your family on a daily basis and are considered to be a staple in a long term food storage plan. Whole wheat is usually the primary grain most associated with food storage supplies. They have high nutritional value and protein levels (organic is more nutritious). Most varieties can be stored for 25+ years if packaged properly and kept in a cool environment. The best reason is to accustom your family to eating them. A sudden change in diet which includes mostly grains will upset their digestive systems. 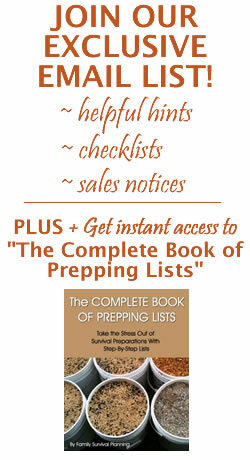 Gather recipes that include grains such as breads, cereals, and muffins. If you do plan on storing grains to use in your daily or weekly menus, you may want to purchase them in #10 sealed cans to avoid having to use all the contents of a 5-6 gallon bucket before they are no longer palatable or nutritious. If you choose to store them in 5-6 gallon buckets, an opened bucket will not store for 30 years. You could, however, package the grains in smaller packets, insert an O2 absorber and put several packets in a bucket. Most grains will last about a year once opened if you are using the contents often. Keep it closed tightly in a cool, dark place, such as the pantry or the basement while using it up. Grinding wheat seems to be a major hang-up for most people. 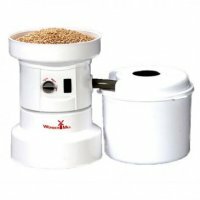 Bite the bullet and buy a good grain mill—an electric one AND a hand grinder in case there is no electricity. 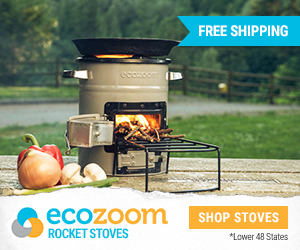 Easily grind wheat, rice, legumes and beans as large as garbanzos. 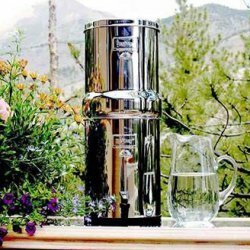 It can even grind oily seeds, nuts, herbs, and coffee! 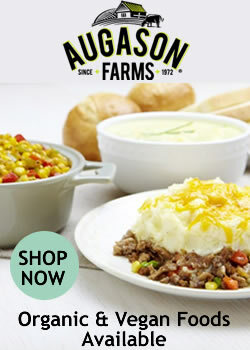 Uses - Breakfast cereal, granola, cookies, filler in meat loafs or casseroles, thickener for soups/stews. Types - Quick rolled oats or regular rolled oats. Quick oats cook faster but regular oats or steel cut retain flavor and nutrition better. Storage - If unopened, optimum shelf life is up to 30 years. If opened should be used within 1 year. I recommend storing large amounts in an airtight plastic container and pulling out a smaller amount every few months for your actual usage/rotation. Uses - Wheat grass (sprouting), appetizers, desserts, breakfast cereals, crackers, brownies, tortillas, breads, pancakes, muffins, cakes, snacks, in salads, to make vegetarian meat/protein, and any other baking item you would use flour for. Types - Spring or winter, hard or soft, red or white. Hard varieties have higher gluten (protein) and are better for making breads. Soft varieties have lower protein and nutrients but are better for pastries, pastas, and breakfast cereals. Red wheats are typically hard and whites are typically soft. However if you prefer the flavor of one over the other you can find soft red and hard white. Experiment with different varieties in your recipes to find out what works best for you. Storage - If unopened, optimum shelf life is 30 years or more. If opened will last about 3 years. However, once ground into flour, wheat loses most of its nutrients within a few days so only grind small amounts at a time. You can add oxygen absorbers, bay leaves, or dry ice to help keep critters out of your wheat. Uses - Grits, cornbread/muffins, mush, johnnycake, hush puppies, breading on fried items. Types - Steel ground or stone ground. Most common is steel ground, it has husk and germ almost all removed. Loses flavor and nutrients but has a long shelf life. This is what you will find at the grocery store. Stone ground retains more of the husk and germ but is more perishable. Cornmeal can be found in white, yellow, red, and blue varieties. Yellow and white are the most common. Storage - If unopened, optimum shelf life is 5 years. If opened will last about 1 year. A better idea, however, is to store dehydrated whole corn and buy a grinder to make your own cornmeal. Whole corn, either freeze-dried or dehydrated, will last as long as wheat - about 25 years. 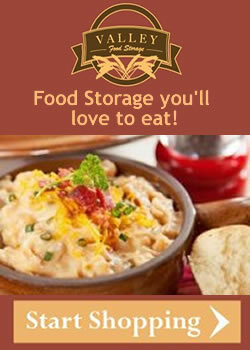 Uses - Rice pudding, cereal, casseroles, side dishes. Types - Bleached or unbleached. Both have had their bran and germ portions removed and are “enriched” by adding back some of the lost nutrients. Bleached has been chemically bleached while unbleached goes through a natural bleaching process. Storage - If unopened, optimum shelf life is 30 years. If opened, about the same. Uses - Brown rice can be used for any dish where you would use white rice. The advantage to brown rice is that it has more flavor (even without adding anything to it), and it's definitely more nutritious. Types - There are no types, except maybe Basmati can be considered a type of brown rice. Storage - Ahhh, here's where there has been a lot of disagreement. Some say 6 months - some say years. The issue, of course, is brown rice can become rancid because it contains natural oils. I have had rancid brown rice. It is not pleasant and rancidity is definitely not good for us. 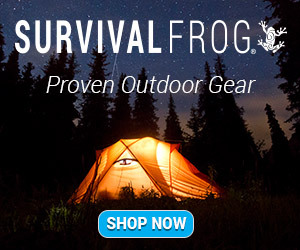 Not all preparedness stores carry brown rice. I have found it at Emergency Essentials and Augason Farms in both #10 cans and buckets. According to their website, brown rice has a shelf life of 7 years if unopened. I would only keep brown rice in the freezer if opened, to prevent rancidity. Uses - Thickener in soups and stews, in sides or casseroles similar to how you would use rice. Types - You can buy pot barley which retains more of the nutritious germ and brand, but it has a shorter shelf life. Pearled barley is recommended for long-term food storage. Storage - If unopened, optimum shelf life is about 10 years. If opened, it's good for about 18 months. Yes, many people cannot enjoy any foods containing gluten, or may have other food allergies that prevent them from eating the most ubiquitous grain — wheat. Some of the grains listed above are safe for those who are gluten intolerant, such as, quinoa, triticale, wild rice, flax seed and millet. So how do you use and store other flours? If someone in your family has allergies to grains, yes, you can store them, but keep in mind that the shelf life of any flour, in general, is not as long as the seed, berry, kernel, or nut it comes from. Also, each of those Michelle mentioned will have varying amounts of oil, nuts in particular have quite a bit of oil in them, which makes them difficult to store long term. So it really depends on how long you want these products to last on your shelf. And don't forget about nut flours. These are great for gluten-free baking. If you're planning for longer shelf life, it would be better to store the original products, like whole rice, oats, wheat, oats, etc. 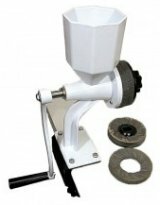 Then purchase a grain grinder and have fresh flours when you need them. Electric grinders are excellent as long as you have electricity. A hand-powered backup is great for times when there might not be electricity. Storing grains that are so basic to our daily meals is not only a good idea, but they are nutritious, healthful. So basically, most grains store very well in a cool, dry, and dark environment for many, many years. 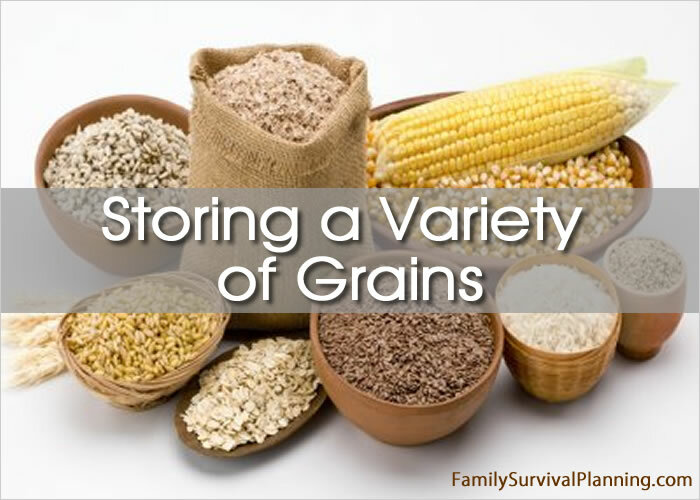 Add the grains that your family likes to your long term food storage.